Joe Flacco picked apart Denver's depleted defense for 277 yards and a touchdown, and the Baltimore Ravens defeated the previously unbeaten Broncos 27-14 Sunday. See photos. BALTIMORE (AP) — Baltimore’s offensive line handled Von Miller, Joe Flacco took care of the football, and the Ravens sliced through Denver’s depleted defense. Baltimore (2-1) got 68 yards rushing from Alex Collins, but the line’s most ample contribution was giving Flacco time to pass against a defense led by Miller, who came in with an NFL-leading four sacks. Flacco went 25 for 40 without an interception on a rainy afternoon. He threw 28 passes in the first half alone, when Baltimore took control. Miller finished with two tackles and no sacks. Flacco’s success came against a Denver backfield that began the day without injured cornerback Adam Jones (thigh) and lost cornerback Tramaine Brock (groin) in the first quarter. As a result, rookie Isaac Yiadom saw significant playing time at right cornerback. Baltimore made 20 first downs, totaled 342 yards and converted half its third-down attempts. Denver (2-1) was coming off two home wins, both by virtue of fourth-quarter comebacks. This time, the Broncos could not rally after Allen’s 1-yard TD run made it 27-14 midway through the third quarter. The Broncos were flagged 13 times for 120 yards. Denver’s lone turnover was just as costly. 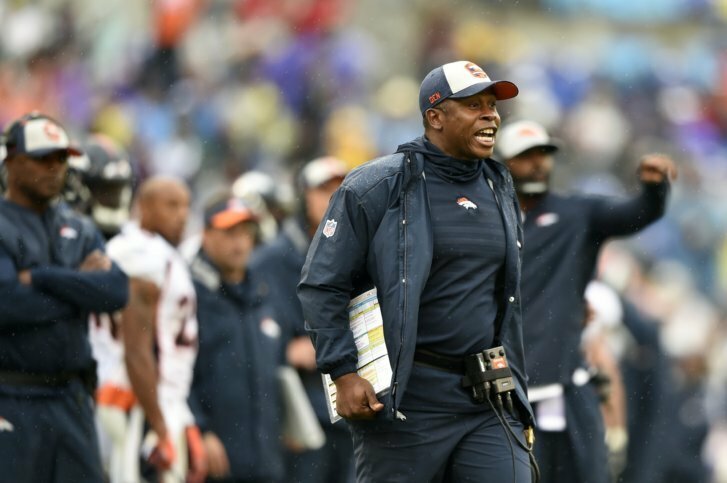 The Broncos were inside the Baltimore 5 with 9 minutes left before Case Keenum was intercepted by Patrick Onwuasor, whose 89-yard return for a touchdown was wiped out by a block in the back. “That was a huge stop,” said Harbaugh, who celebrated his 56th birthday in style. Denver got a touchdown after blocking a punt and also swatted away a field goal try. Chris Harris Jr. took the second blocked kick 58 yards for a touchdown, but an illegal block nullified the second-quarter score. After Denver’s Joseph Jones blocked a punt to set up a 6-yard touchdown run by Royce Freeman, Collins ran in from the 6 for Baltimore. Broncos: Stewart left in the second quarter with a shoulder injury but returned. Broncos: host Kansas City in an AFC West showdown Monday night, Oct. 1. Ravens: travel to Pittsburgh for a Sunday night matchup between AFC North teams.